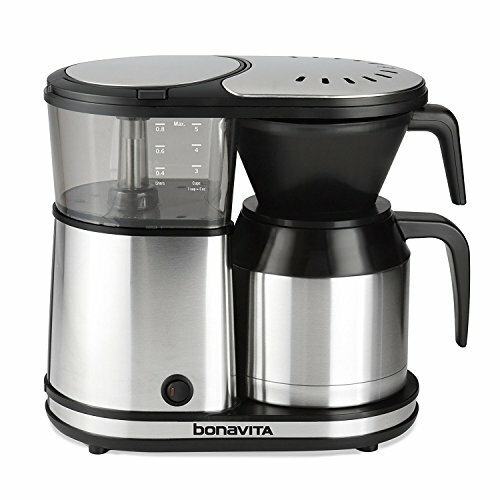 Ideal for coffee aficionados, this coffee maker delivers the quality and performance that fans of Bonavita's innovative brewers have come to expect in a smaller package that's great for a few cups at a time. Impeccably engineered to deliver a balanced cup, this compact coffee machine is the perfect addition to your morning routine. Manufacturer: Bonavita. Model: BV1500TS. Includes: Unit, carafe. Material: BPA-free plastic, stainless steel. Care: Hand wash carafe. Descale regularly following manufacturer's instructions. Use: For use with #4 Melitta filters. Dimensions: 12.3" x 6.2" x 10.6". Capacity: 25 oz.. Watts: 1100 W. Warranty: 2-year warranty. Made in China. FEATURES1100-watt thermal block heater quickly and efficiently raises water to the ideal brewing temperature. Engineered to deliver the perfect brew in smaller batches of three to five cups. Specially designed showerhead completely saturates the grounds and is optimized for small batches. Optional pre-infusion mode wets coffee to allow proper bloom before brewing. Filter features a flat bottom for even saturation and extraction. Water tank features a wide opening and clear markings for precise measuring. Heater shuts off automatically a few minutes after brewing. Carafe's trigger lid ensures mess-free, one-handed pouring.